The HP ProLiant Server Management Packs for Operations Manager 2007 include predefined tasks that can be used to access in-depth server information, carry out advanced remote server administration, and perform lifecycle management on multiple servers, clients, printers, and other networked devices. HP tasks appear in the Actions window. Not all tasks appear in every view, because tasks are associated with specific classes. The HP Custom Data Manager (CDM) maintains user-specified text information on a per server basis. It can store text information such as warranty expiration, server memo, and server location description. The text information format is open to users, and the CDM provides the means to view and input the information. 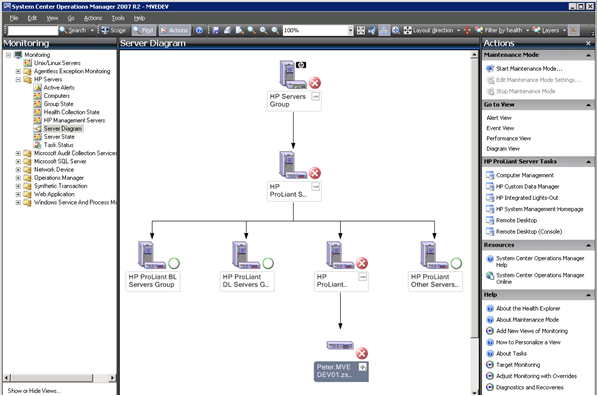 CDM is a console task on Operations Manager 2007 and launches from HP Servers Groups and sub-groups. It automatically locates the Operations Manager 2007 host name from the Operations Manager registry with user credentials. Users need the proper access credentials to use this tool. CDM communicates with the SDK interface of Operation Manager 2007 and enumerates all HP Server systems in the Operations Manager 2007 domain. It does not enumerate non-HP servers. 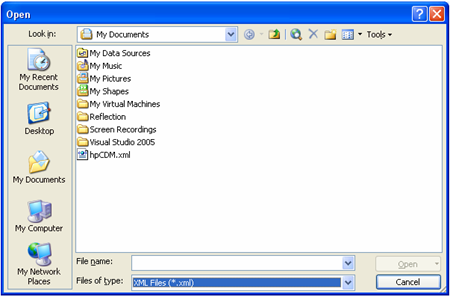 Open File allows users to load a previously-saved XML file to update the Custom Data section. Save File allows users to save enumerated HP Server data to an XML file. Microsoft® Excel can be used to edit the saved XML file to be loaded back to the CDM tool to update the Custom Data section. NOTE: The saved file must be saved as XML data, not an XML spreadsheet. 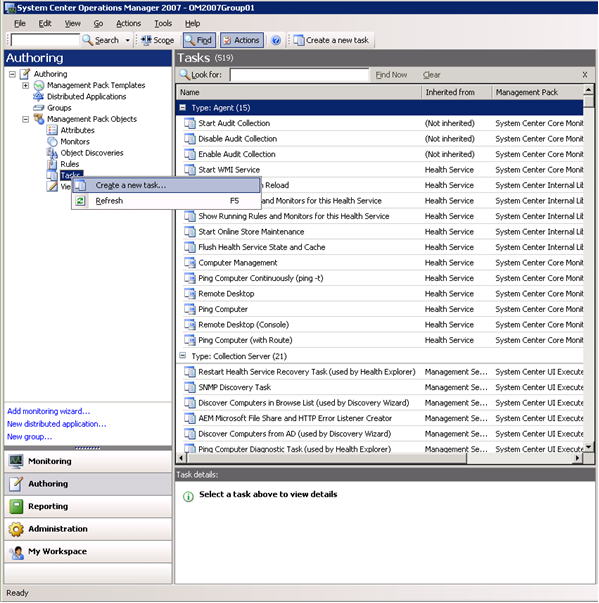 ReConnect allows users to reconnect to an Operations Manager 2007 server with current user credentials to retrieve current HP Server information. Update allows users to sync with an Operations Manager 2007 server for Custom Data update. 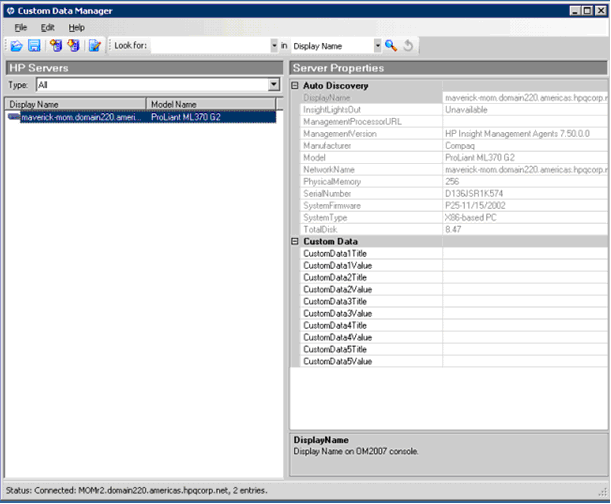 Exit and Remove Connecter allows users to close CDM and remove the Connector interface specifically for CDM from Operations Manager 2007. Edit Names Properties allows users to set the CustomDataTitle properties to the desired string. There are five CustomDataTitle properties which users can set for all HP Servers. The checkbox in the HP Recommended Set provides the HP recommended default set of names. Select an HP Server group or an HP Server subgroup. Click HP Custom Data Manager. The Custom Data Manager screen will appear. This screen shows the Server Properties and the default Custom Data fields. Select one of the command buttons described above to perform the desired operation. For example, to change or set the strings in the Custom Data section, click Edit, and select Name Properties. Enter the strings for the five common names desired, or click Click to set HP recommended set of names. NOTE: Using the HP-recommended set of names only sets the CustomDataTitle properties. The corresponding Custom Data value fields must be entered manually. Enter the strings for the CustomDataValue fields, click File, and click Save to save the custom data to an XML file. 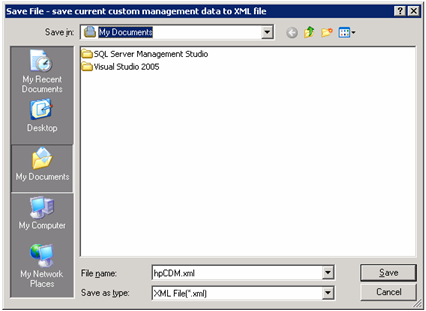 Click Update to save the custom data to the Operations Manager 2007 database. Click File>Open to load a previously-saved XML file. Select the Display Name option to list a specific server, and enter the server name in the Look For textbox. Select the Model Name option to list all servers of the same model, and enter the server model name in the Look For textbox. 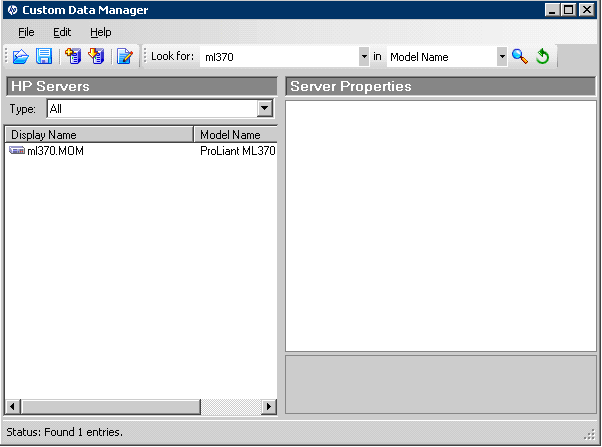 Close the Custom Data Manager window to exit the CDM. Click File, and select Open to load a previously saved XML file. Select XML Files (*.xml) in the Files of type dropdown list, and select the previously saved file. Click Open. Select how you would like to open the XML file. Select As an XML list. Click OK to view a standard Microsoft® Excel spreadsheet. Only columns CustomData1Title to CustomData5Title, and CustomData1Value to CustomData5Value are customizable. Editing other properties is not allowed. After editing, click File, and select Save menu. Select XML Data from the File Type menu. Click Continue to ignore the warning and Microsoft® Excel saves the result to a XML file that can be loaded to CDM. The SMH provides a consolidated view of system hardware health, configuration, performance, and status information for individual HP servers. 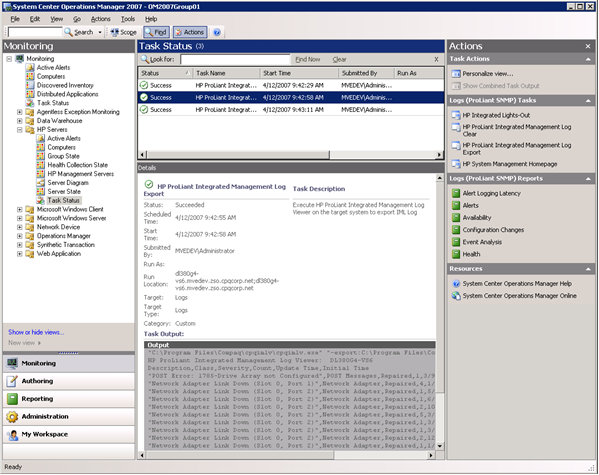 The HP ProLiant Server Management Packs for Operations Manager 2007 include a task to launch the HP SMH for an individual computer. This task is associated as a console task on Operations Manager 2007 to launch from any HP ProLiant server. Select an HP ProLiant server. 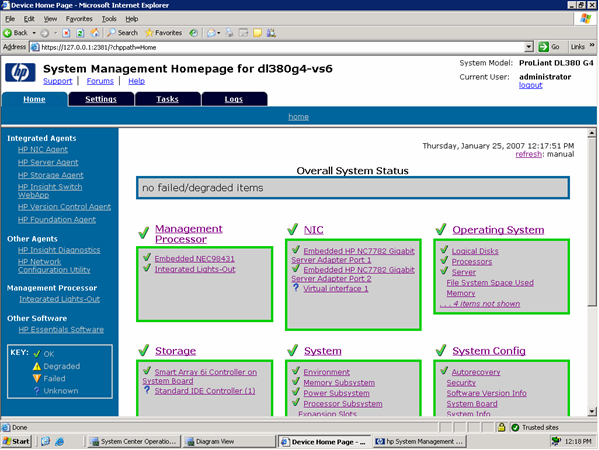 Click HP System Management Homepage. HP SIM is discovered and monitored by HP ProLiant Management Packs. The discovered HP SIM servers are displayed in the HP Management Servers view. Select HP SIM in the main pane. The HP SIM task is available at Actions pane. 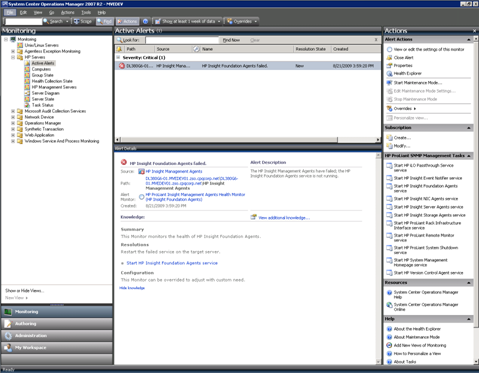 Universal HP Systems Insight Manager task can be defined as a custom console task from the Authoring tab view. Custom HP SIM console tasks can enable the easy launch of HP SIM from any view. To create custom HP SIM console task, complete the following procedure. 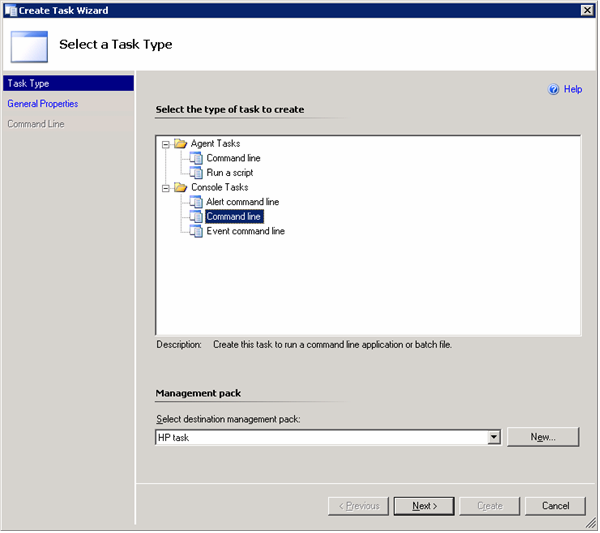 Select Command Line in the Console Tasks folder, and select a Management Pack to store the custom task information. Click Next. Enter "HP Systems Insight Manager (Custom)" in the Task name textbox. Select Task target to "HP Logical Hardware". Click Next. Enter "https://<HPSIMServerName>:50000". Deselect the "Display output when this task is run" checkbox. Click Create. HP Systems Insight Manager (Custom) console task is now available in the Server State and Active Alerts views. Three Microsoft® Windows® tools are available from the Server State view and the Diagram view when an HP Server is focused on the view. These console tools launch Windows® native tools on the local system to remotely connect to the selected HP Server. Both tasks run remotely on the target system with the results seen on task screen on the Operations Manager Console. Both tasks are associated with Logs Collection so these can be accessed from Health Collection State view or Server Diagram view. The task results include record table with Excel CSV format, so it can import to Excel after manual editing for easy viewing. Select Health Collection State View. Locate the target Logs collection from the list on the main pane. 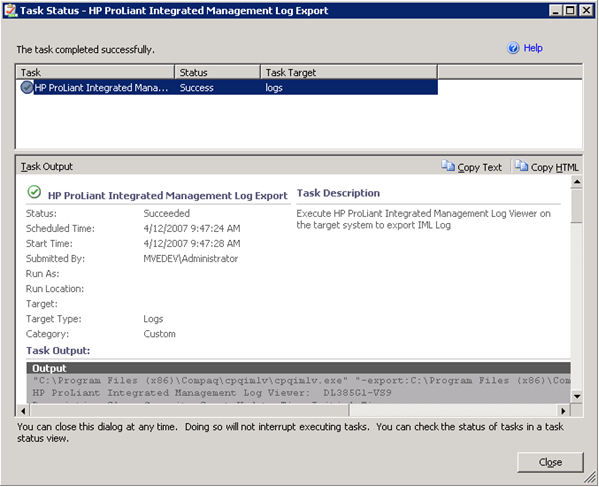 Click one of the tasks such as HP ProLiant Integrated Management Log Export or click Clear from action pane. The confirmation screen is displayed. Click Run and wait for the results to display. Click Task State View to retrieve latest results of tasks anytime. HP ProLiant servers can include an Integrated Lights-Out management processor, which enables you to perform advanced, secure, and operating system-independent remote server management using a standard browser interface. The HP ProLiant Server Management Packs for Operations Manager 2007 include a task that collects HP Integrated Lights-Out management processor data and creates an associated browser link to remotely access the selected HP ProLiant server. Select the HP ProLiant server for which the management processor will display information. Log in to HP Integrated Lights-Out. From the Active Alerts view, select the alert for the failed HP service. From Alert Details or Actions Panel, click the HP ProLiant Management task name. 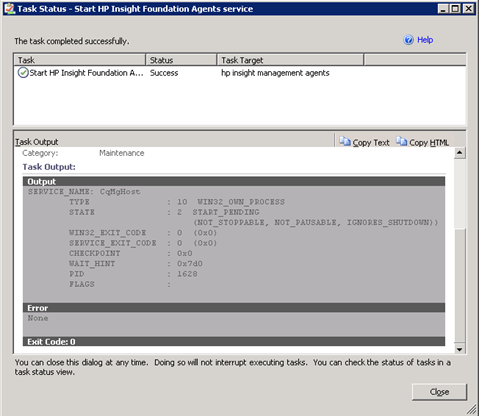 The task name might be Start HP Insight Foundation Agents service. From the Run Task dialog, click Run. To ensure that the service has started, wait for the task to complete, and then observe the output from the Task Status dialog.